Ah, to be young and in love and lounging around being waited on hand and foot. It feels amazing to relax on clean, white sheets and think your thoughts while wearing your ribbon necklace and your gold house heels and nothing else. So we started our first full day in Paris MUCH MUCH TOO EARLY with a pre-scheduled Context Tour of the Musée d’Orsay. I didn’t take into consideration how much we would need to sleep after weeks of nonstop working days and nights and weekends and then the long flight and wow was I difficult to get going this morning. Once we got up and caffeinated, we hustled down the road for a brisk 30-minute walk across the city center to the museum. If you only take one guided tour in your life, make it a Context Tour. I have taken many different tours in the cities of Europe and Context is hands down the best. Each walk is like a concentrated college class tailored to you and maybe three other people. Every group has six participants or less and the guides are PhD-level scholars in their field. 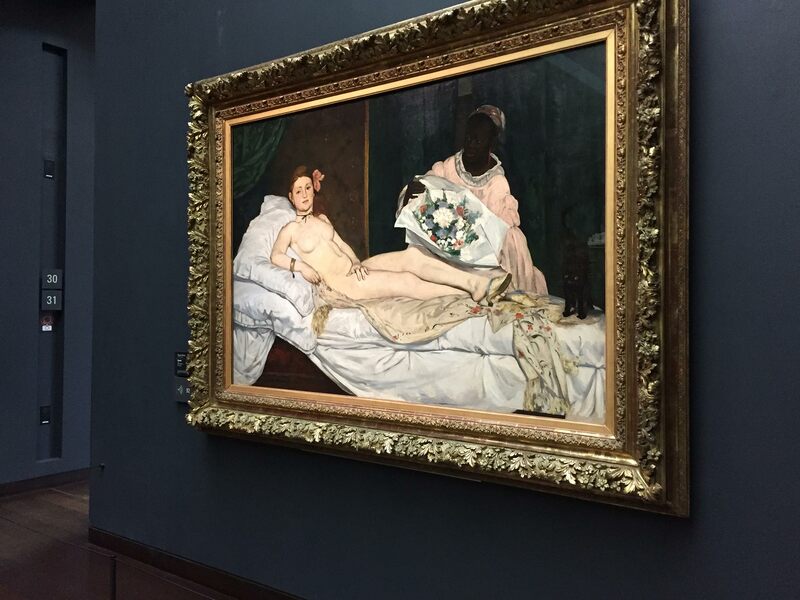 The tour we booked was a guided walk through Musée d’Orsay and Paris in the 19th Century. Our guide was Isabelle Pepin, and I fell in love with her immediately. We met her at a cafe near the museum and she started the tour by walking with us to the bridge across the museum for a historical overview of the building itself. I soon discovered she was also a passionate fan of Suzanne Valadon (my favorite artist) (hence the love). As we walked methodically through the galleries of the d’Orsay, she made each of the paintings and scenes come alive with a mix of history, art technique, and interesting anecdotes about the artists and their lives. The tour lasted three hours and afterwards the Captain and I stayed in the museum for a delicious lunch at the restaurant. There are two cafes and one sit-down restaurant at the museum, be sure to pick the restaurant. It’s well worth the line and the higher price, the food is delicious. While we talked over lunch, the Captain told me this was the first time he’d really looked at paintings that way, as Isabelle explained the perspective and composition and symbolism of each. I had been worried about dragging him to what was basically a very high-end art history class, but he was digging it! 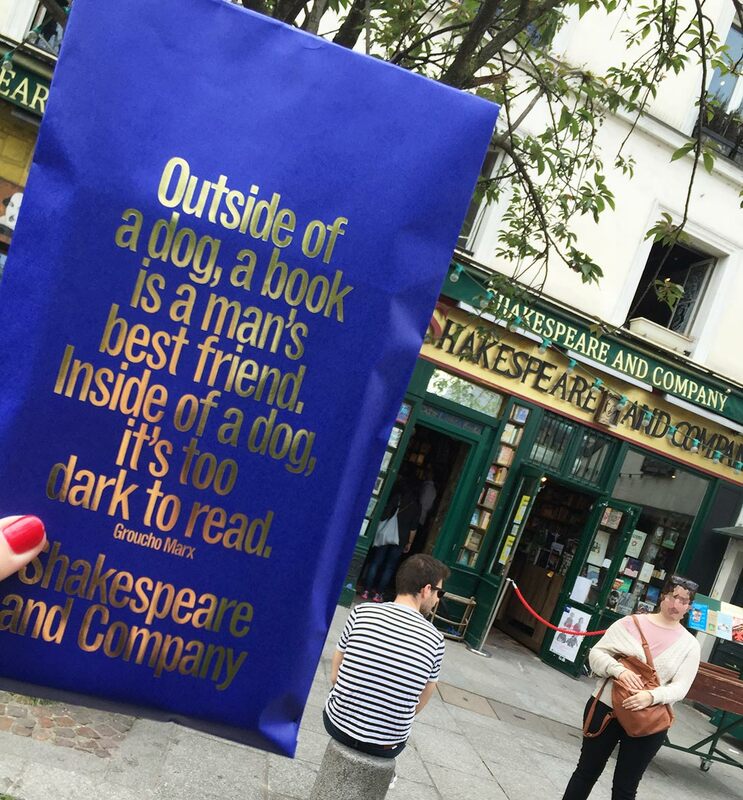 After lunch we walked down the banks of the Seine to the famous Shakespeare And Company Bookstore. This pic was actually taken on a previous trip but I loved it so much I put it here. This is the famous bookstore you may have seen in the movie Before Sunset, and it is often jam packed with folks lined up around the block. We got there at a good time (still crowded but no lines.) I bought some yummy Cara Black novels and took surreptitious photos. After yet another trip to the market for juice and baguettes and mustard and baby carrots, I LOVE GROCERY SHOPPING IN PARIS SO MUCH YOU GUYS, we headed back to the apartment to rest and relax before dinner. After all, it is tough work to appreciate all that art and eat all that butter and buy all that literature. Vacation is rigorous. Before long it was already time to eat again. Dinner wasn’t planned, in fact we hadn’t made any plans except for the tour all day. But Drew and I were texting and we decided to meet up at a restaurant he and G. found in the Latin Quarter. Sometimes all the best moments come from having no itinerary at all. The Captain and I walked over to the left bank and meandered over to their apartment — it’s a lovely rental from Haven In Paris and I’ve stayed there myself many times before, so I was excited to be able to show it to the Captain. Dinner was ridiculously tasty. I am not sure how many french fries I can eat in one day but I have not yet maxed out. Many bottles of wine were passed about and my French got better and better as the night wore on, I told myself. No small sentence to write but this was by far the best Valentine’s day of my life. Art, books, Paris, best friends, delicious food, a man who loves me even when I make him get up at the armpit of a.m. to see 19th century paintings. I want to freeze this moment and live inside it forever. The Clothes Are Laminated And The Suitcase Zips! "Where are we going and why are we in this handbasket?" Starting to take some of the improvements from the guest room and add them to my bedroom, like this cool power outlet for the bedside table. I’m hoping it helps with the constant problem of needing to charge all devices simultaneously. Still obsessing over Sew Over It and Lisa Comfort, the lady boss behind it all. Here is her site, YouTube vlog, and Insta. I bought pretty much every pattern they have during the recent 30% off sale. Interested in these silica gel packets for my yarn stash. Does anyone out there add these to ziplock baggies of yarn? Merry #DevinNunes Is An Idiot Day to all who observe. Watch Lighthizer get so frustrated by trump’s stupidity that he treats him like a 5 yr old. RL: Fine. You’ll sign it if we call it a trade agreement? Then we’ll call it a f*cking trade agreement, dumbass. NOTE: I am not paid to endorse or use any products. Not that I would mind, so if you have a Boeing Dreamliner you need me to ride in for a first-class seat review, call me. Hi! Laurie Perry (crazytourist.com) is a participant in the Amazon Services LLC Associates Program, an affiliate advertising program designed to provide a means for sites to earn advertising fees by advertising and linking to Amazon.com.